North Las Vegas Mayor John Lee bet it all on a long-shot economic development project - and won big. Las Vegas brings to mind images of glittering casinos, staggering wealth and endless success. Once called the epicenter of the American Dream, the city seems almost magical in its decadent splendor. However, the city’s neighbor, North Las Vegas, was rarely thought about in such sparkling terms. The city has been economically depressed for decades, serving as a bedroom community for its more successful counterpart to the south. Hit especially hard by the Great Recession, North Las Vegas was spiraling out of control financially. On the verge of losing its charter, North Las Vegas needed a miracle. The city’s deliverance came in the form of Mayor John Lee. 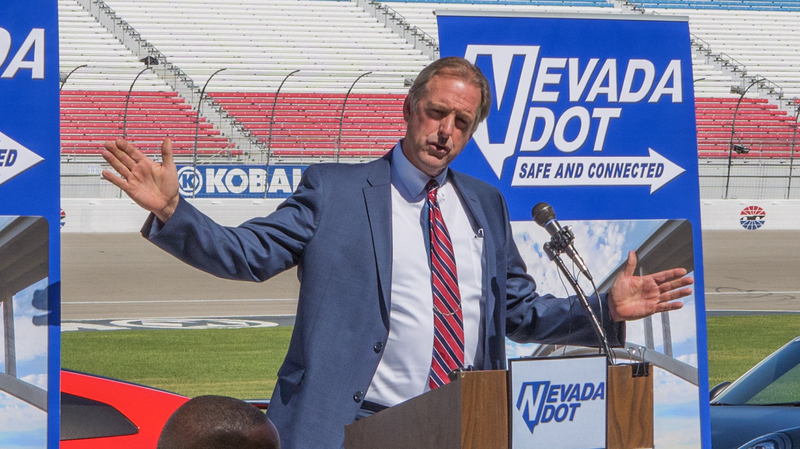 Using the skills he acquired through years of business ownership coupled with the experiences gained during his time as a state senator, Lee was able to quite literally pull North Las Vegas back from the brink of collapse. It is for this reason that Mayor John Lee has been selected as American City & County’s 2016 Municipal Leader of the Year. When Lee took office in the summer of 2013, North Las Vegas was in economic and political turmoil. The city was staring down a $152 million budget deficit and was about to be dissolved. When Mayor Lee took office, greater Las Vegas and Clark County officials were already drawing lines to divide up the city. In a matter of months, North Las Vegas would cease to be. Lee’s enthusiasm for his community is evident, and his passion for public service is contagious among colleagues and coworkers. During his tenure, he has used his public and private sector experience to better the lives of those around him. To do this, Lee knew he first had to get North Las Vegas’ finances in order. Rather than increase the burden on existing companies and residents, Lee knew the only way to reverse the city’s fortune was to attract new businesses and diversify the city’s economy. He spent the first two years of his term understanding the complexities of the problem, exploring his options and laying the legal and regulatory groundwork for change. But before any of this work could start, Lee needed to learn the best ways to do it, and to do that, he went to those with direct experience. One of the first things Lee did when he took office was to look for guidance from those who had gone through it before. At the time, Detroit was going through its bankruptcy proceedings, so Lee got in touch with city officials to understand the implications of their financial distress. As he found out, they were staggering. “It sent shockwaves through my spine,” Lee says. Looking at what happened in Detroit, Lee realized a North Las Vegas bankruptcy would not only impact his neighbors, but had the potential to economically decimate the region. “It would have taken a generation to get through it,” he adds. It was clear bankruptcy wasn’t an option, so he was tasked with rebuilding the city’s finances from the ground floor. But to do that, he needed help. “When [Lee] won the mayoral race, he sat down with me and asked, ‘What are the best practices? How do you fix a city like this?’” says Robert Lang, executive director of Brookings Mountain West and professor of public policy in the Greenspun College of Urban Affairs at the University of Nevada, Las Vegas. Lang is the author of “Boomburgs: The Rise of America’s Accidental Cities,” which explores the unique challenges that face large, fast-growing suburbs. North Las Vegas is heavily featured in this work, and Lee was interested in getting the academic’s perspective. Lang encouraged Lee to reach out to Scott Smith, the former mayor of Mesa, Ariz. The three visited together and discussed how Mesa, which a number of years ago was in a similar situation to North Las Vegas, was able to ultimately become financially viable and successful. Smith impressed upon Lee that the mayors of towns like Mesa, North Las Vegas and others with limited resources and stagnant economic development options have to be very proactive in their handling of issues, Lang says. The message was loud and clear: You’re the mayor. You have to make things happen. Leaving Mesa, Lee was thinking big and thinking in the long term. He knew quick fixes were not going to solve the problems of North Las Vegas. He had to use the resources available – what little there were – to the best of his advantage. “From the beginning, Mayor Lee wanted to rethink North Las Vegas’ niche within the region, that it’s a bedroom community to Las Vegas without economic engines of it’s own,” Lang says. Lee knew that needed to change. During the first two years of Lee’s term, he was able to increase the internal efficiencies of North Las Vegas, but he knew something major needed to happen in order to completely turn the city around. That’s where Apex Industrial Park came into play. For more than two decades, local and international businesses had been interested in the unused 18,000-acre industrial park on the outskirts of the city due to its proximity to transportation infrastructure, regional location and the massive amount of space available; however, there was one major stumbling block – Apex lacked the basic utility infrastructure needed for businesses to set up shop. This created a Catch-22 situation: utility companies were unwilling to invest in the area unless there were businesses there, and businesses wouldn’t set up shop until utilities were set up. Lee knew that if North Las Vegas was to be saved, Apex had to be developed, so he made it his mission to break the stalemate. Lee and his leadership team knew they had to entice businesses through incentives in order to be competitive and began to think outside the box to get it done. They knew the city itself had limited resources and little bargaining power to court large businesses, so they had to think bigger. As luck would have it, state law had recently been changed in order to help attract automaker Tesla to northern Nevada. At the time that law was passed, no one knew it would be key in saving North Las Vegas. By piggybacking off of that law’s language, legislation could be passed that would benefit other locales. Lee explains: In the state of Nevada, you can’t tailor a piece of legislation to only impact one business or one municipality. 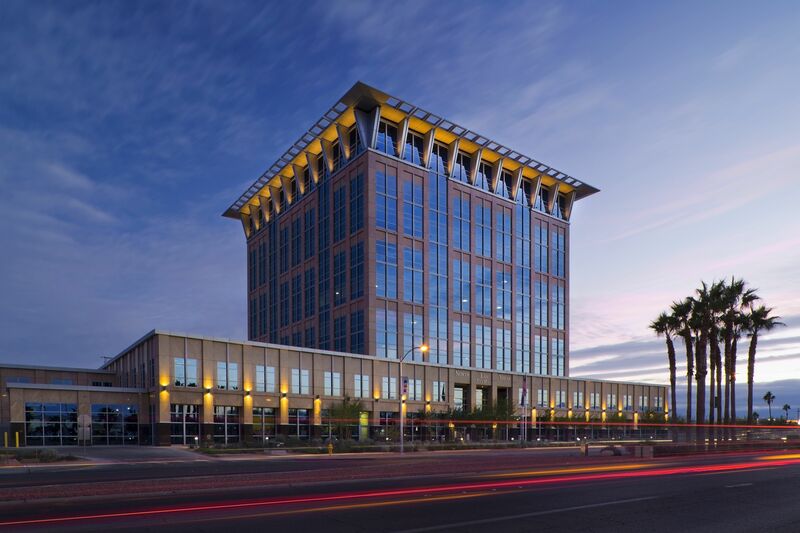 Using this legal precedent and working with state legislators and Juden, Lee was able help get new legislation drafted that would empower North Las Vegas and cities like it to start being competitive when it comes to economic development. With Lee’s help, the new law was passed during the second special legislative session ever dedicated to economic development in Nevada state history. With state resources now available to help fund infrastructure projects, Apex was suddenly a much more attractive prospect for companies. Lee and his team began actively working to attract large, diverse companies to North Las Vegas and repair the city’s fledgling finances. After an involved search, one company in particular stood out as the perfect fit – Faraday Future, an electric vehicle manufacturer headquartered in China. After negotiations with the company, Faraday selected North Las Vegas for its new manufacturing site from a list of about 200 competing cities. The new, $1 billion Faraday manufacturing plant will bring with it 4,500 new jobs, result in an estimated $87.5 billion in regional economic impact over the next two decades and provide a net increase of $760 million in new tax revenue. Faraday expects to be up and running by late 2017, early 2018. And Faraday isn’t the only manufacturer moving to North Las Vegas. In the wake of the Faraday announcement, Lee brokered a deal with Hyperloop One to use Apex as its development and test site for advanced electric propulsion transportation systems, helping to further solidify North Las Vegas’ growing reputation as a leader in the technology industry. In addition to this, more than a dozen other vendors and support companies have committed to opening their doors in North Las Vegas. The city’s turnaround was remarkable for a number of reasons, but considering how badly the community was hit during the recent economic downturn, Mayor Lee’s success is even more impressive. A lot of the creativity Lee displayed he learned in the private sector. However, one of the most important aspects of running his city, he says, has been opening the lines of communication between leadership and employees. Lee takes pride in the fact that he’s broken down barriers that were established by previous administrations, and that he can take a hands-on role in running the city. Wood also shares that while economic development has been one of the mayor’s major focuses, he hasn’t lost sight of improving other aspects of living in the city. 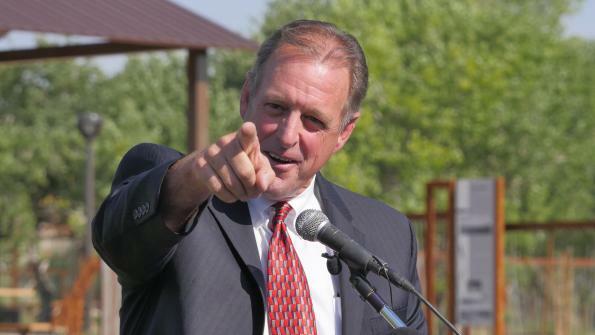 Lee has also spearheaded an effort to establish a medical district and job creation zone around the city’s Veterans Affairs Medical Center, and played a key role in lobbying the Bureau of Land Management to transfer about 200 acres of vacant desert to the city for these purposes, while at the same time establishing the Tule Springs Fossil Beds National Monument – a project that had been shelved since the Great Recession. Additionally, Lee is overseeing the revitalization of the city’s gateway and downtown urban core, installing $24 million in sewer upgrades and nearly $9 million in road improvements. The overall quality of life has improved in North Las Vegas with Lee at the helm. The streets are safer with the hiring of dozens of new firefighters and police in 2015 and 2016 after the city endured a five-year hiring freeze. The city also recently opened a new library in city hall and cut the ribbon on a new historic park which houses the oldest remaining structure in southern Nevada. Juden sums it up like this: “[Lee] has one thing he says a lot – ‘If it happens within the corporate boundaries of North Las Vegas, it’s my problem.” By this, the mayor means that even if something happens within the city limits due to another entity – be it the state or federal government, the county government or the school district – the mayor will address the issue head on and work to reach a solution. Ultimately, Lee says growth is the key to success, not austerity. “We cannot cut our way to success; we have to grow the city out of the problem,” he says. And that growth, according to Lee, will bring North Las Vegas and the region as a whole prosperity it’s never known.